Dr. Duke Heller, author of the recent BMH book How to Start a Kingdom Conversation, recently received the following e-mail from the head of a traveling singing group. 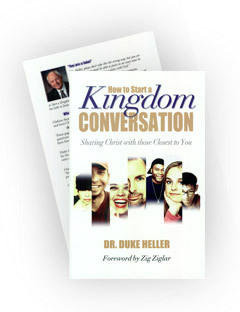 Heller’s book is available online at www.bmhbooks.com or by calling (toll-free) 1-800-348-2756. We praise the Lord for the way He is using this and other BMH products to build the Kingdom. My name is John Sipe. I recently received your book How to Start a Kingdom Conversation and I think it could be a vehicle that can be used in our area to expand the Kingdom. Three of my daughters and I have gospel singing group called the Sipe Family. Last week while we were ministering to a church, my daughter gave her testimony of how she had been working in Ohio for eight months in a factory setting with people who knew she was a Christian, but because of fear and many other needless excuses she kept putting off sharing the gospel with them. Early in January she was unexpectedly laid off and regrets all the missed opportunities to advance the Kingdom. As she shared this testimony on stage she was very emotional and the congregation was very moved along with myself and the rest of the family. As we went into our last two songs I shared with the congregation that I was currently reading your book and how it has been a challenge to me. This concert was truly a spirit-filled event that was very special, and ministered to us as a group as much as it did the congregation. After the concert several people asked about your book and brochure and I referred them to your website. It occurred to me later that the people who inquired about the book might not follow up by seeking out your website. However, if we had copies of your brochure and book at our product table, it would be readily available to all the people whom we minister to. Often I feel as though we are “singing to the choir,” even though I know that not everyone we come in contact with is a believer. Our mission statement is to point non-believers toward Christ and disciple believers to lead a Spirit-filled life. I feel that if we could pass your book and brochures along as we travel, believers might be moved to step out of their comfort zone and share Christ with the lost. Our next concert will be in Van Wert, Ohio, at a large gospel expo featuring many groups from all over the country April 6-9. If at all possible, I would love to be able to offer your books at that time.